Most parents will tell you that they just wish they could understand why their baby is crying. As cute as babies are, the reality is they can be immensely distracting during church worship services. So what can you do about it? One of the challenges during the design of worship spaces is, “How do we include those parents that need to spend some time nursing their babies or comforting a little one’s upset heart?” Traditionally, cry rooms have been designed somewhere “out of the way” and the service is piped in over loudspeakers in an attempt to keep the parents connected while they tend to their baby. Over the last several years I’ve noticed a few designs where the cry rooms are placed just behind the worship center with window partitions looking into the space. Combining the newly recaptured visual element with an audio broadcast greatly improves the experience of parents who don’t want to miss out on the experience of the service. Personally, I love this design approach, but I have to caution that care should be taken to ensure that noise isolation is considered. A crying baby makes a lot of noise and can still be a distraction if the partition wall is not carefully considered. Additionally, sounds generated in the worship center could upset the baby and trigger a crying episode. 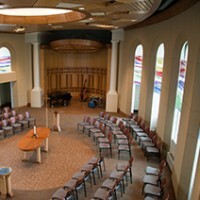 The good news is careful design and consideration of the acoustical performance of these partitions can bring the parents closer to the worship experience without further upsetting their child and causing a distraction to the other congregants. When we are involved in the design of a church or worship center, our goal is to improve the experience of everyone in the building, from babbling babies to children and family ministries, staff and administrative offices and, of course, to the worship service itself. At Acoustics By Design, we consider every area of your building an integral part of your ministry, and we desire to see them perform to their acoustic best!